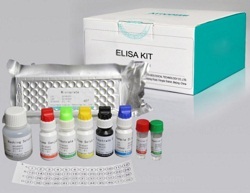 ALB, also known as Serum albumin, is the most abundant protein in human blood plasma. This protein constitutes about half of the blood serum protein. It is soluble and monomeric. Albumin transports hormones, fatty acids, and other compounds, buffers pH, and maintains osmotic pressure, among other functions. Albumin is synthesized in the liver as preproalbumin, which has an N-terminal peptide that is removed before the nascent protein is released from the rough endoplasmic reticulum. Recombinant human ALB, fused to His-tag at C-terminus, was expressed in insect cell and purified by using conventional chromatography techniques. Liquid. In phosphate buffered saline (pH 7.4) containing 10% glycerol.